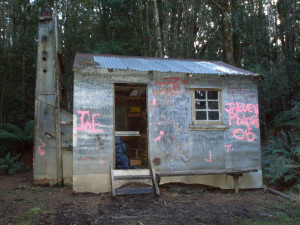 Turnbull is a basic bivvy hut, the lowest grade of Department of Conservation huts. Four walls and a roof, plus fireplace and bunks and not much else. Nonetheless, it was chock-full of character, and had obviously been used and enjoyed for decades. I spent an extra day there, partly because after two very long days I was tired, and partly because I’d wrenched one of my ankles in all that bloody mud and could barely limp across the hut floor. Seriously, I couldn’t understand it. By some miracle it hadn’t rained for days, and yet mud was still stubbornly and deeply present, ever ready and waiting to try and take a boot. It nearly did, too. It must need an entire summer’s drought to dry up the last of it. 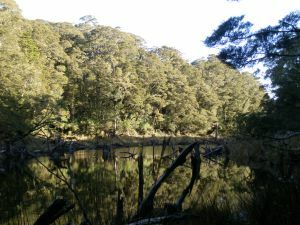 The area around the hut was the most beautiful I’d seen in the Longwoods – trees straight out of Fangorn Forest. And there was this beautiful little old dam which on its own was worth the entire walk: one of the prettiest little lakes I think I’ve ever seen. However, these two unscheduled extra days had left me short on food, so after another night at Turnbull I had to stumble back down to the end of Cascade Road. Amusingly, 15 minutes or so after I had left the hut (and, it must be said, this was, unlike PWR, a very well marked track, with blazes nearly every 5 m ((I amused myself thinking about Orange Gordon and his amazing trained pack-sheep, Bertha)) I came across a sign I had seen and cursed the day before yesterday. 5 MINUTES TO HUT. Needless to say it was wrong, broken, and resting in a pool of mud, but some other annoyed and teased-beyond-endurance tramper had vandalised the sign to give a more accurate impression. I’m betting it wasn’t a Southlander. Truly unfortunately – I still can’t understand how it happened – at the bottom of Cascade I got turned around and starting heading for hours down this horrible gravel road. Too late I realised I was nearly back at Riverton, rather than going onwards to Otaitai, but after a minute of reaction I shall not repeat I had to laugh. Hitched a ride on an empty schoolbus back to the Globe in Riverton, and gorged myself stupid on pizza and beer, before deciding that I think I’d had enough exercise for now, thank-you, and headed back to Dunedin.